Pomegranates have recently become very popular for their health benefits, tart flavor and vibrant color. Pomegranate trees are naturally very bushy. 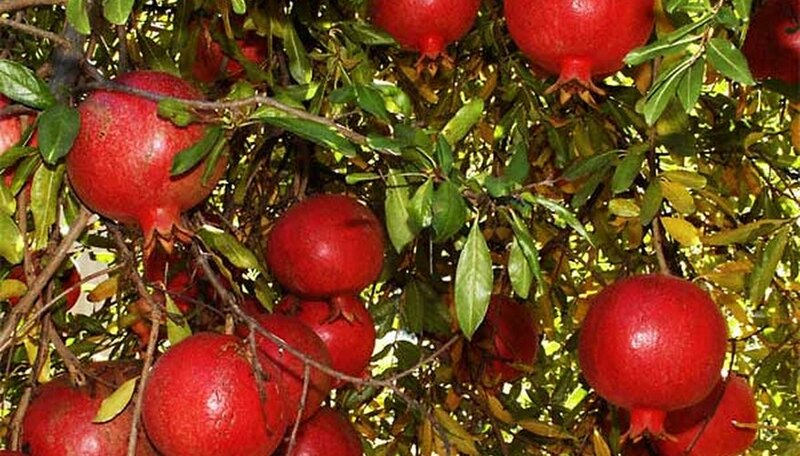 They require considerable pruning of the main branches and attention if you are growing the pomegranate for high fruit yields. If you prefer the pomegranate tree to be mostly ornamental to experience the beautiful fall leaf color and spring buds, it is best left with minimal pruning, as you would do with any other tree in your garden. Examine the trunk of the pomegranate tree. Look for small shoots coming from the main trunk, from the bottom to the top. They will range from small to medium size, from green to red. Put on gloves if desired. Use the pruning shears to trim off all of these shoots that you see, cutting them close to the trunk as possible. Discard these shoots. Continue pruning any branches that are excessively bushy, stick out at awkward angles, or that look damaged or diseased. Shape the tree as you wish, usually in a oval or round shape. Pomegranate trees, especially young ones, may require staking; they have soft wood and may blow over easily. Pound the stake into the ground next to the trunk with a hammer, and use twine to tie the trunk to the stake in a couple places. Keep it staked until you feel the pomegranate tree is strong enough. If you want your pomegranate tree to yield high amounts of fruit, you will need to prune it much more drastically. Lower the height of the tree by trimming all the main branches. Use the shears to trim off not only the short shoots as you did in the first section, but also the main branches. Chop them off close to the stump. This will induce new spring growth which will produce more flowers and more fruit. Apply small amounts of pruning salve to the open ends of the shoots you cut. This will prevent insects or bacteria from getting into the tree. You can have the best of both worlds. It is possible to enjoy the ornamental aspects of the pomegranate as well as harvest some fruit. If, you want to enjoy the beauty of the pomegranate while getting fruit at the same time, prune the tree as you would for ornamental value, but prune off one to two of the larger main branches. By spring you will have re-growth, some fruit yield, and you can still enjoy the light green foliage, flowers and fruits of spring and summer, and the vivid leaves in the fall.